The following calculations are based on some “facts” that I found on the internet. So they must be true. Please don’t flame me. I know there are numerous flaws in my model but I think it is sufficient to high-lite the importance of making prudent choices in one’s spending habits. I could have compared to vacations, entertainment, wardrobe or even nonfat-soy milk-extra whip-frappuccinos. The concept is simple, do without some things so you can afford other things. The Wealthy Barber, mom & dad, etc., not a new concept. 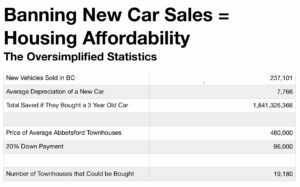 Housing in the Lower Mainland is expensive and it’s likely to become even more expensive. It’s the most beautiful place on the planet (yes I’m biased) so people want to live here and due to geographic and land-use constraints supply is extremely limited. Supply and demand, again not a new concept. If you want to own a piece of paradise don’t resent those that bought before you. Instead, learn from their example. Be disciplined and find a way to save, even if it hurts!